KEDMOR pioneered bridge maintenance surveys in the country. Aging stocks of bridges require maintenance in order to prevent breakdown or interrupted service. Such operations require clear prioritization, in order to make the best use of resources. KEDMOR provides bridge inspection, analysis and maintenance surveys. Surveys and inspections are carried out according to internationally proven methodologies, adapted where needed to specific local characteristics. Inspections are performed for specific needs as well, such as post impact damage assessment. Bridge inspections are performed by well-trained and equipped teams. Recommendations are made to optimize the design of the repairs and maintenance. Aging stocks of bridges require maintenance in order to prevent breakdown or interrupted service. General DescriptionEm Ha’Moshavot Bridge is located perpendicular to the future Red line of the Light Rail Transit (LRT) and axis 2 of the bridge is located between the LRT future tunnels. The bridge is founded on piles. The boring and excavation of the LRT tunnels will be on either side of the piles at axis 2. In order to avoid a clash between the bridge and the tunnels, the piles are monitored 24 hours a day for deflections and strains. The piles are equipped with 3D strain gauges, slope gauges and fiber optics to monitor strains. All gauges are connected to a data-logger set in the girder. The data-logger then sends information to Kedmor digitally. Quarry Bridges are located on road No. 60, near the Iksal junction, above the former Roichmen Quarry. The superstructure of the two bridges is made of a box girder 3.30m deep. The total width of each bridge is a constant 11m. The bridge has a total length of approximately 414m, which is divided into 6 spans; 1 x 46m, 2 x 78m, 2 x 77m and 1x56m. The bridge has a total length of approximately 409m, which is divided into 6 spans; 1x 45.4, 2x76, 2x 77 and 1x56.1m. Pier 2 is much shorter, and therefore stiffer than the other piers of this bridge. A special gap-element at the top of this pier enables the rest of the columns to respond prior to this pier in the event of an earthquake and thus preventing premature failure. A non-linear gap element was implemented as part of a pushover analysis in order to fine-tune the over-all seismic response of the bridge. The bridges were designed for two construction methods. The western part of the bridges was cast in-situ Incremental launching. 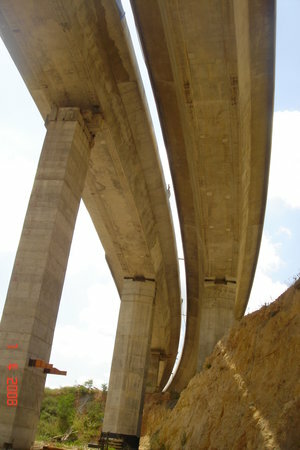 The eastern part of the bridges was constructed using the Precast Balanced Cantilever method. The maximum length of a segment in the incremental launching method is 22.5m. The length of a typical segment in the balanced cantilever method is 3m.